(Bloomberg) -- Ahead of the earnings season, European shares are bubbling near an eight-month high, making yesterday’s retreat seem mild against the broader rally. In the past quarter, several big companies issued profit warnings, yet the reaction of investors has been somewhat surprising. Among the names that have caught my eyes are a number of major European tech companies, namely Infineon, AMS, ASML and Ingenico. Infineon has gained 15 percent this year. Infineon quickly recovered from a profit warning in late March. AMS warned in February and even suspended its dividend, but the shares are near a five-month peak now. Part of that may be a correction from excessive pessimism in late 2018, when a lot of bad news got priced in. Also, it seems that short-sellers have at least partially covered their positions on some of these stocks since then. It’s not just the tech sector. German carmaker BMW has also recovered its losses after cautioning on earnings. Among financials, France’s BNP Paribas simply shrugged off its warning, while Julius Baer is up a staggering 17 percent two months after cutting its targets. Even UBS has recovered after sayings its last quarter was among the worst environments in recent history. One possible reason for the strength is that earnings-per-share expectations seem to be on the rise after several months of decline. After a rally driven by dovish central banks, easing trade tensions and signs of a bottom out in PMIs, companies may need to show some profit growth. At the moment, the expectation bar is still quite low. Obviously, there are exceptions. Airlines are a good example. 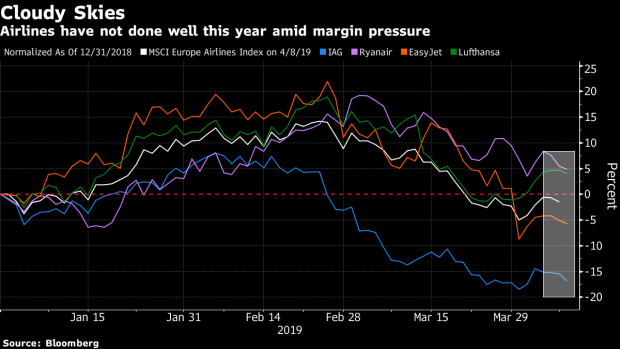 Lufthansa and Easyjet warned about their earnings this year and the shares have yet to recover. The sector was penalized by Brexit uncertainty, rising oil prices as well as margin pressure. The earnings season may prove to be crunch time for the Stoxx Europe 600 to sustain this year’s 14 percent rally. There are obstacles to overcome with trade jitters heating up again between the U.S. and Europe, Italy raising its budget deficit forecast and the IMF cutting its global growth outlook to the lowest level since the global financial crisis.In the meantime, Euro Stoxx 50 futures are down 0.1% ahead of the open. Watch the pound and U.K. stocks after the European Union are set to reject U.K. Prime Minister Theresa May’s plea for a short Brexit extension, and instead give her a longer delay of up to a year at today’s summit. This is another defeat for May that will leave Brexiteers in her party fuming. Watch banks as the European Central Bank’s rate decision comes a day after the International Monetary Fund made cuts to its 2019 growth forecasts, with the outlook for euro-area countries significantly affected. The ECB is said to be in no rush to soften the impact of negative rates on the banking sector. Here’s a decision day guide. Citi refocuses its valuation approach within the European auto parts sector, says with revenue growth coming under pressure that cash flow is becoming ever more important. Valeo is downgraded to sell, while broker reiterates buy on Michelin. Continues to like Valeo’s ethos, although skeptical on its ability to sustain current margins considering the pressures faced by its customers. Valeo is lowest-margin supplier and has highest rate of investment, which exposes “mediocre” cash generation. Citi’s 2019 and 2020 Ebit estimates for Valeo are 5% below consensus. Within the food industry, the long-held advantages of scale, major brands and mass marketing has “been all but eroded,” but these large-cap companies are starting to fight back, Barclays says in a note. Prefers new overweights Nestle, Danone and overweight-rated AB Foods, with Unilever and Lindt rated new underweight. Says Danone has healthiest portfolio and structural growth of its plant-based products underappreciated, while Nestle still has plenty of scope to unlock value even after strong recent performance. Concerned by Unilever’s margins and lack of room for structural change. --With assistance from Hanna Hoikkala.